1. Create 2.Reduce 3. Select. The objective here is to come up with a list of 10-20 potential goals. Don’t worry about making them SMART at this point, just capture your ideas. For those of you who have no problem identifying your goals, do it! Write down those 20 or more goals. Now go to step 2. For the rest of us there are often so many things we want to do or change that there is no one thing that comes to mind. Take Jill for example. Jill has always been interested in many things. She likes to discover and learn new things but then easily gets bored and moves on to the next. Her family and friends often call her ‘Jill of all trades’ (no kidding). When she wanted to work with her coach, the coach told her to select just one goal (a wise coach). The reason for selecting only one goal is that it increases your chances of successfully implementing positive change. Jill did not know how to select just one. She couldn’t even begin to write down a list of goals. So she and her coach used a different approach. This approach breaks your life into different areas (sometimes roles) to help conpartmentalize the goals. Draw a circle on a piece of paper or whiteboard. Now divide that circle by drawing lines like spokes on a wagon wheel. 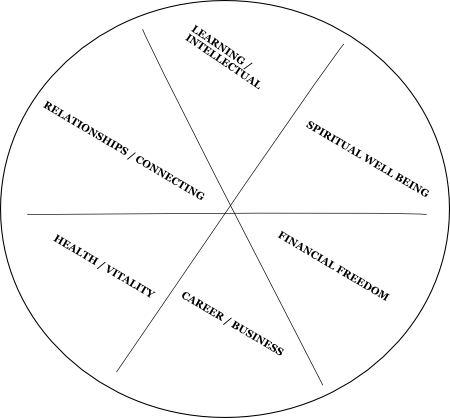 In each section created by the spokes, write in one area of your life (or role you ‘play’). For example you may have family, friends / social, work, finance, health, and so on. Jill reviewed each category in her wheel and listed several goals for each. What am I tolerating in my life/work? What am I missing in my life/work? What do I want more of/less of in my life/work? When considering what outcome you want from each goal, consider visualizing yourself and/or the situation after the goal is successfully completed. What do you see, feel, hear, do, say, have etc. Not only is this important to reduce your list, it will also get you that much closer to a SMART goal. The value question is a lot more difficult. If you don’t already know what your top 3 values are, review ‘finding your why’ to identify them. Once you know your values, you can align each goal to one of those values. If a goal does not align, put it aside. If you have trouble answering either question, put that goal aside and go on to the next. Only those goals that have answers to both questions make it through this step. Does your life or livelihood (or someone’s you love) depend on this goal? Is there a critical deadline associated with the goal? Do you get pumped up just thinking about it? Are you ready and willing to do whatever it takes to achieve this goal? Now that you have your goal, it’s time to take action with purpose.